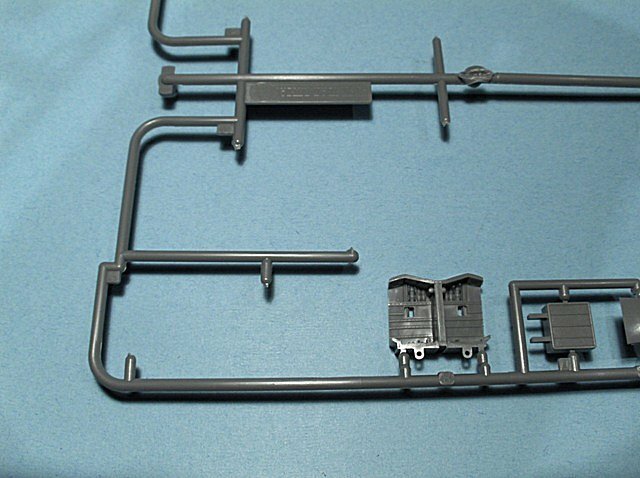 The subject of the basic modeler's tool set comes up all the time. A lot depends on what you want to accomplish. If you're sitting down with your kids for the first time, some sanding sticks or sandpaper, glue, a couple of bottles of paint, some brushes and a little guidance are all that is needed. 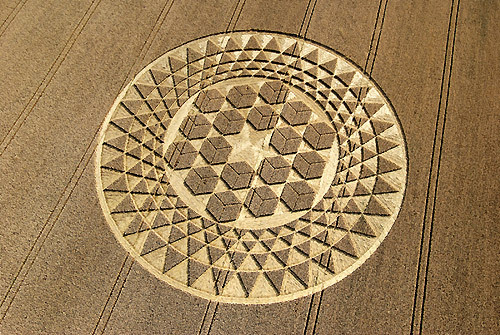 In a little while you will get to see a beaming face saying, "Look what I did!" 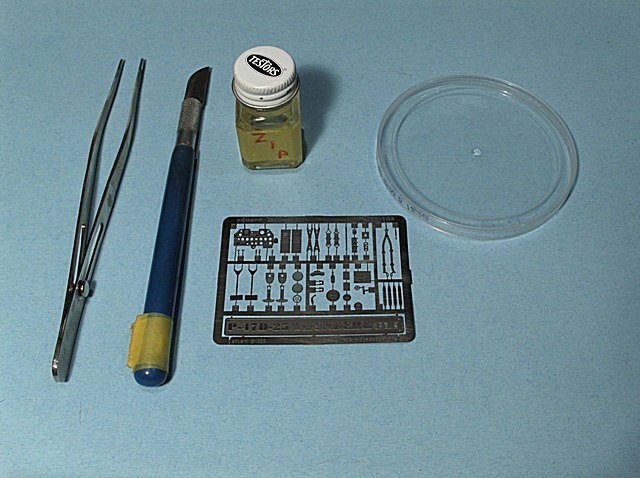 If you are planning a complex kit with resin and photo etched after market accessories, whether you have developed the skills yet to get it all together or not, your "basic" tool list is vastly different. So having said that, what follows are the tools and techniques I use. Any product reviews will be based on first hand knowledge but will still be my opinion and nothing more. Most of these techniques are things I have picked up from magazine articles during modeling's medieval period (pre-internet) and modern times. So if you are the sitting there saying, "I did that first." I say thank you... great idea. 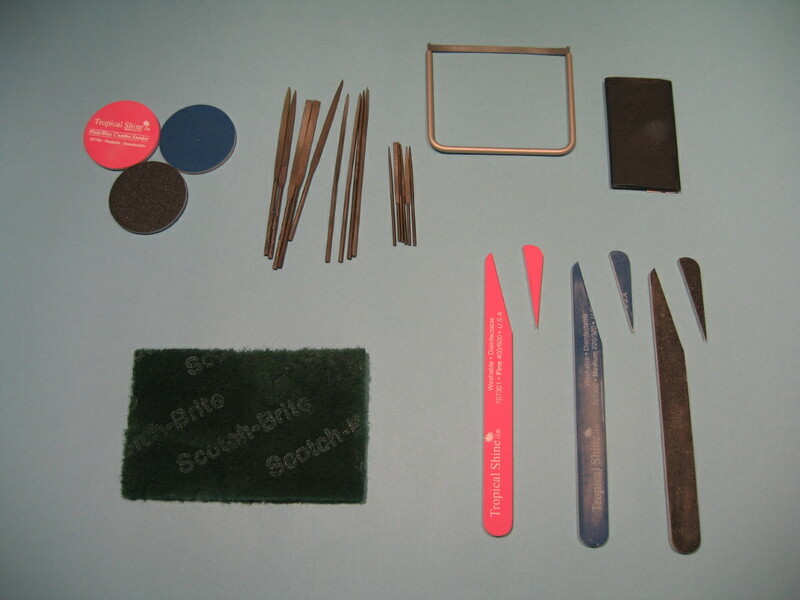 My sanding arsenal includes large and small jeweler's files, sanding discs and sanding boards from the beauty supply store, sanding block of either wood or foam board from meat packing, a Flex-File and a Scotch-Brite scouring pad. The Scotch-Brite pad is one my favorite tools for part prep and finishing. I will use it on almost every piece of a model in one way or another. It is great for cleaning, de-burring after filing, removing mold lines, etc. In most cases it will remove mold lines without any other sanding or having to scrape with a hobby knife. 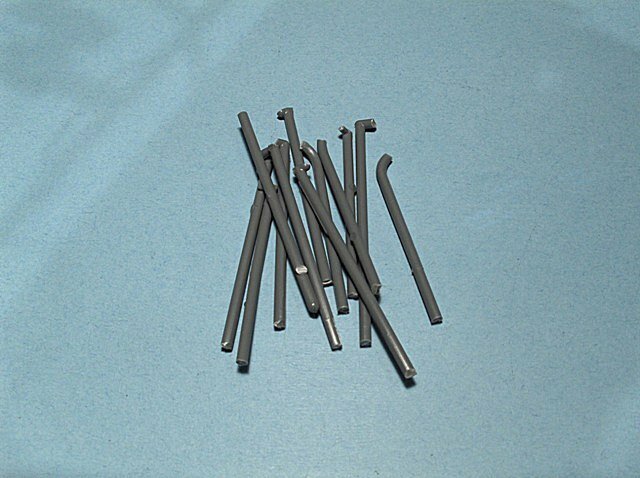 The photos below are a a 1/48 Bf 109 landing gear. 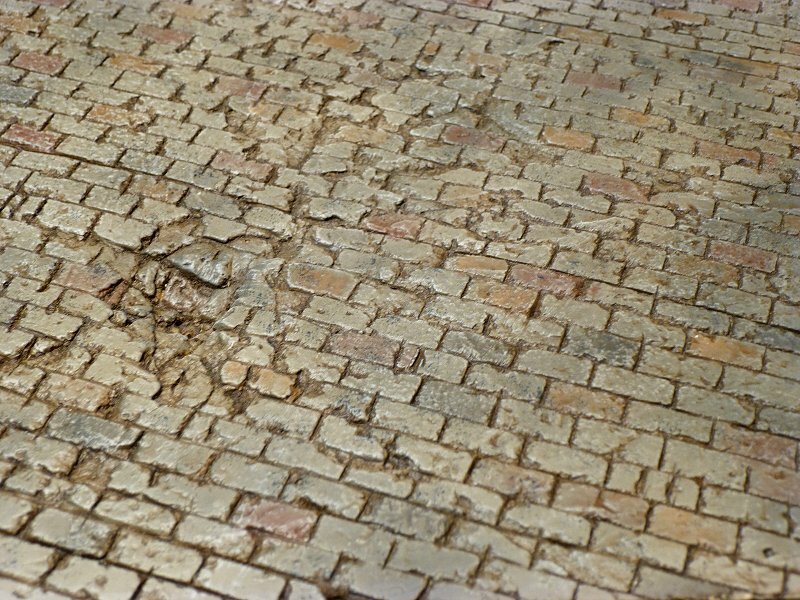 Note the mold line is removed, even in the small crevices and yet leaves the raised detail. Ever have this mishap with Tenax and a Touch & Flow? Let it completely cure and a light buff with a Scotch-Brite and it disappears. Even without the spill, I will go over the wing root after running a line of Tenax down the seam and the fibers of the pad get in there and smooth the joint and doesn't bother the detail. Cockpits, wheels wells, landing gear etc. can almost always benefit from a little added detail. 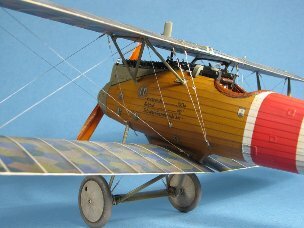 You don't need to possess great scratch building skills to add a few wires or hoses that can be eye catching. Craft wire is available in many sizes, usually in a sliver or gold finish and very shiny. Rolling a length of wire between sanding blocks will straighten it out and take the shine off, giving it some "tooth" to hold paint better. Lots of time it won't need paint at all. 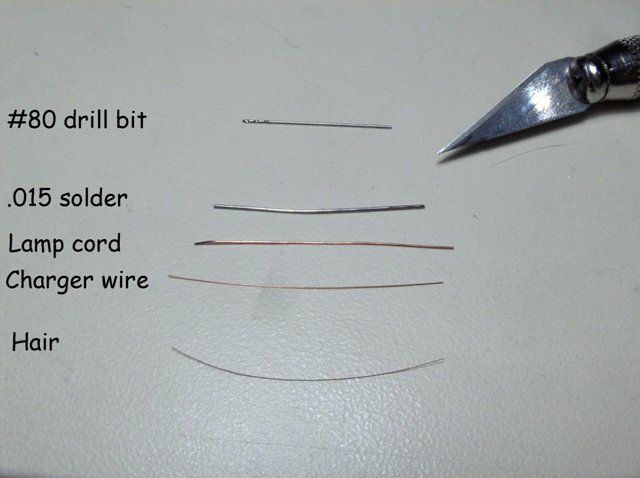 Solder, available in many sizes at places like Radio Shack, is also great for detailing. DO NOT sand it like the craft wire or you will contaminate your area with lead dust. The rosin core in the solder makes a nice center to drill out and glue in a smaller diameter piece to simulate steps in piping sizes or insulators on wiring. The wire, not the solder, can be darkened with "Blacken-It" for some nice effects. 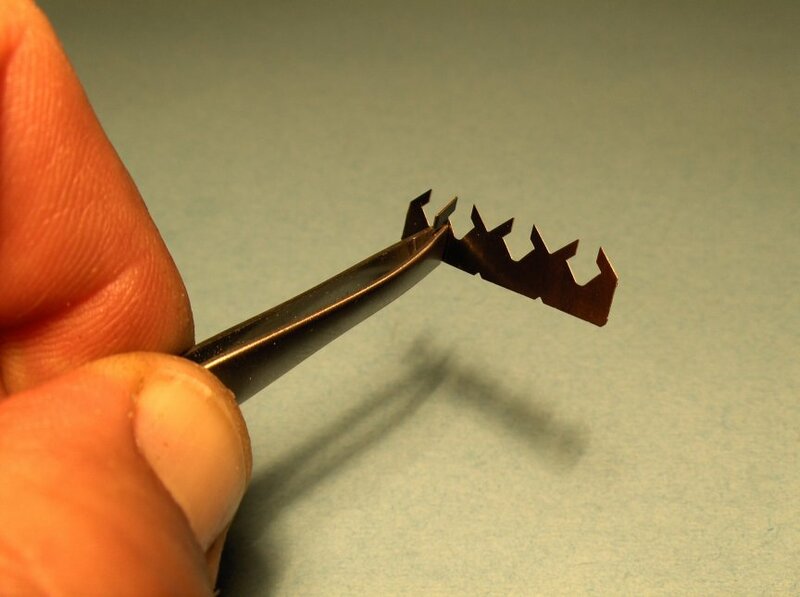 After cutting the part off the PE fret with a small pair of nail scissors the nubs are trimmed with nail clippers. One day I will invest in an Etch Mate but in the mean time, these are some alternatives. A steel ruler holding the part at the fold line on a sheet of glass and bending it with a single edge razor blade work well for longer bends. 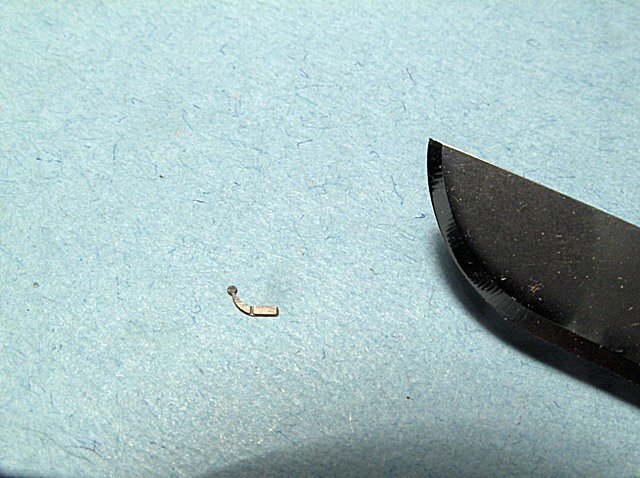 Flat pliers and tweezers work fine for small parts. Sometime you feel like you need 4 hands to hold some of these parts in place to glue them. 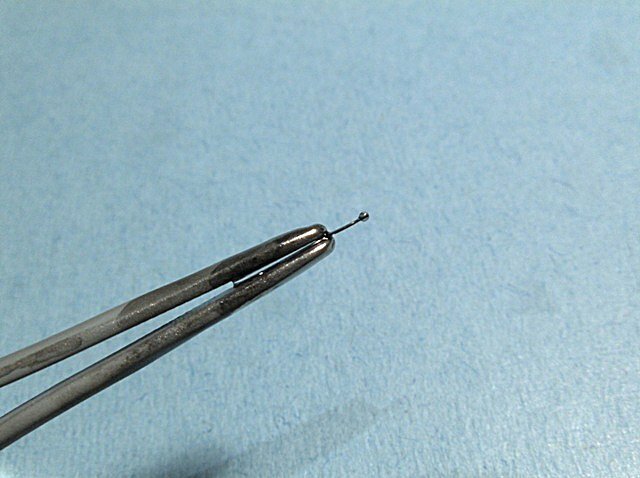 A small puddle of thick CA and a dip of the part held in tweezers, and hold it in place. 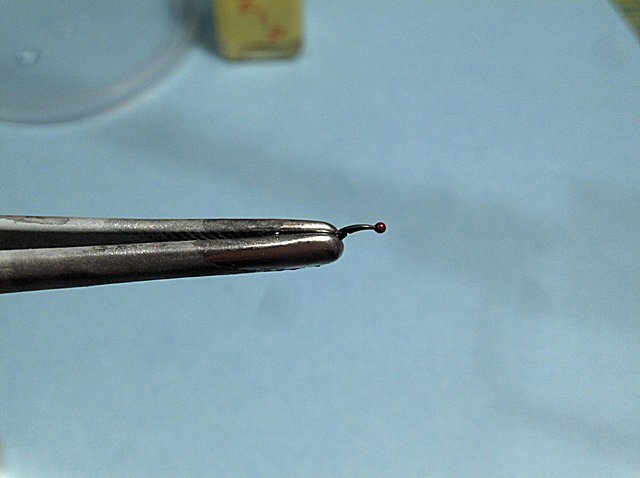 A small tool made from a sewing needle with the end of the eye cut off ,making a tiny little fork, holds a tiny drop of accelerator that can be precisely placed instead of a the huge blast from a spray bottle. 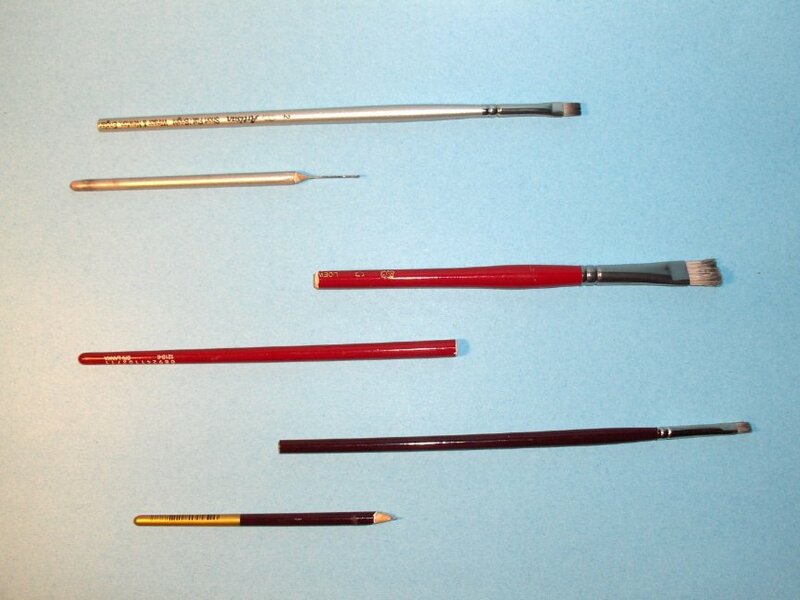 When I need a new brush I will try to choose ones that have a long handle. Some of them are over 12 inches long. The handle can be cut off and have a variety of uses. 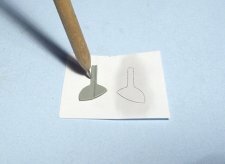 They have a very hard gloss surface and the rounded ends are perfect for burnishing tape and shaping photo etched parts. These are handy for making handles for some homemade tools. The tool at the top of the photo is for applying CA accelerator. A close up is in the Photo Etched section above. I have a second one, not pictured, I use to apply the CA also. It needs to be cleaned every now and then as the glue dries in the little fork but the tip of a hobby knife takes care of that easy enough. The 2nd tool is a sander. 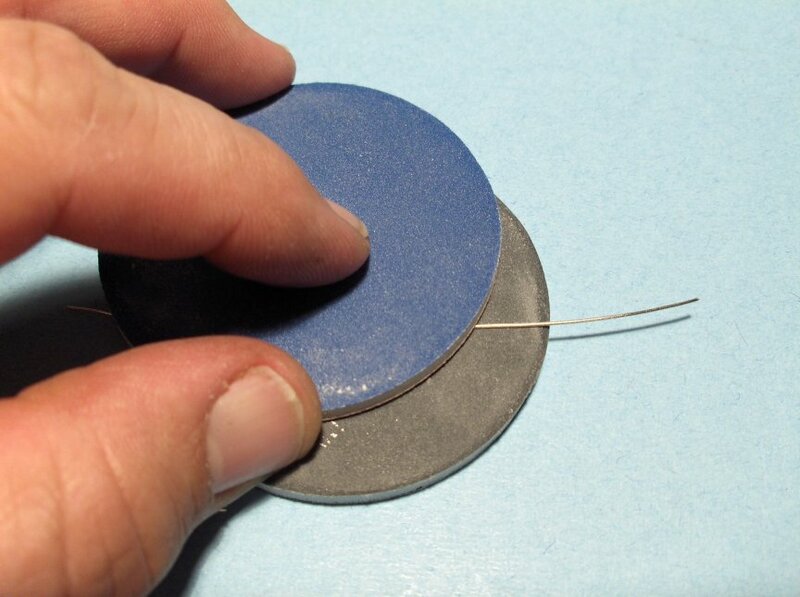 I use a hole-punch to cut a small disc of sandpaper and glue it to the end of the handle. Great for tight spots. The bottom tool is a riveter. 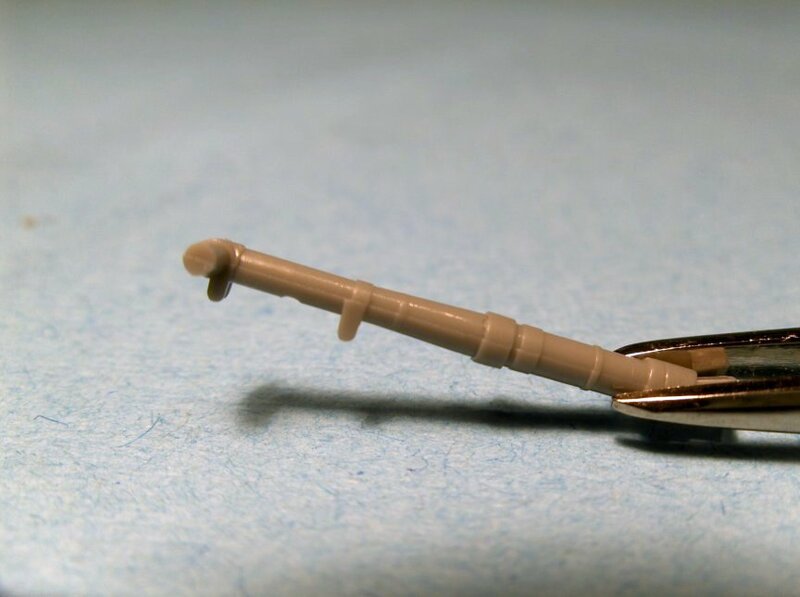 It has a short length of hypodermic tubing glued in the handle then sharpened to make tiny circle simulating flush rivets or cowl fasteners, like on a P-40. Pre-painted PE detail really makes for some impressive looking detail. 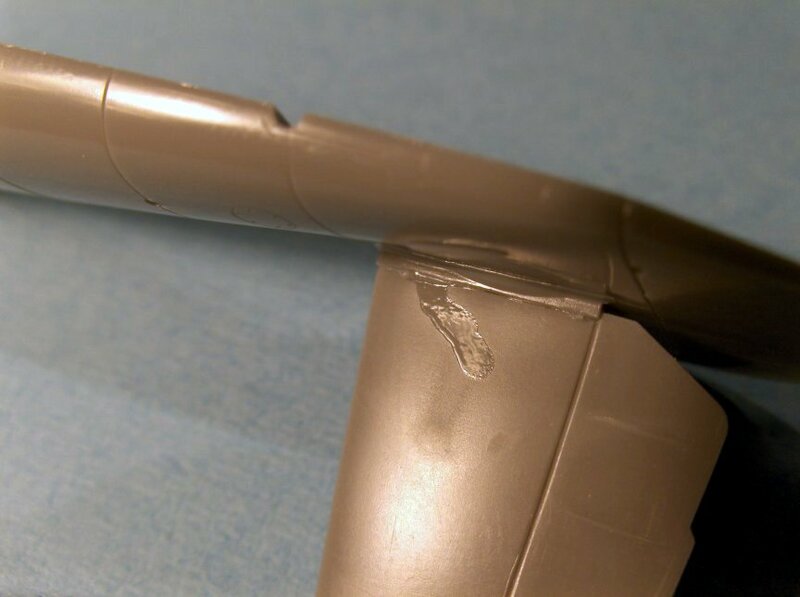 Care must be taken in the handling and bending of the parts to reduce the chance the painted detail chipping off. If painted surface need to be glued, and it is practical to do so without harming the detail, scrape the paint away before applying the glue. 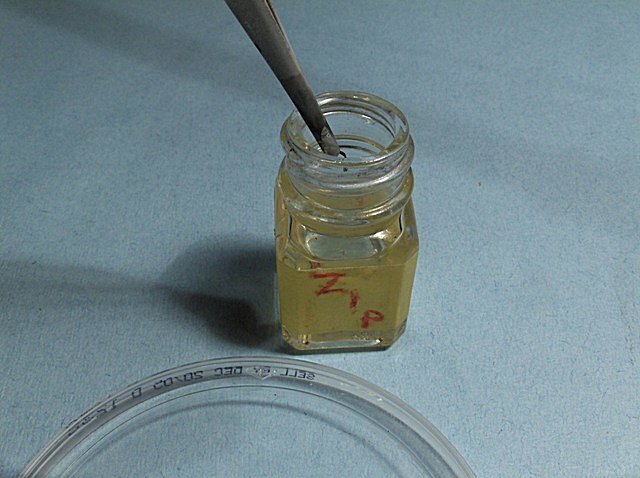 The glue to metal bond will be stronger then the paint to metal bond and parts will be a bit more secure. 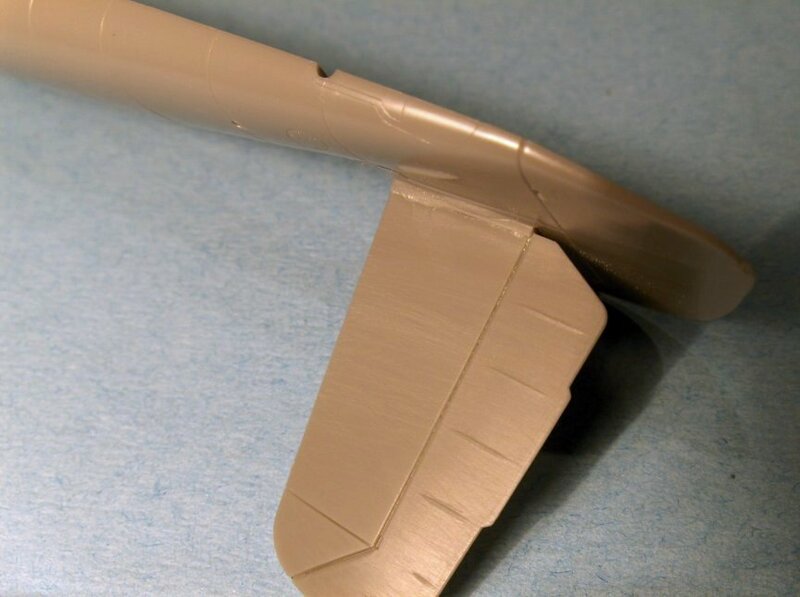 Hold the flat edge of the clipper against the part and use the side of the fuselage, in this case a 1/48 scale Bf-109, as a guide. 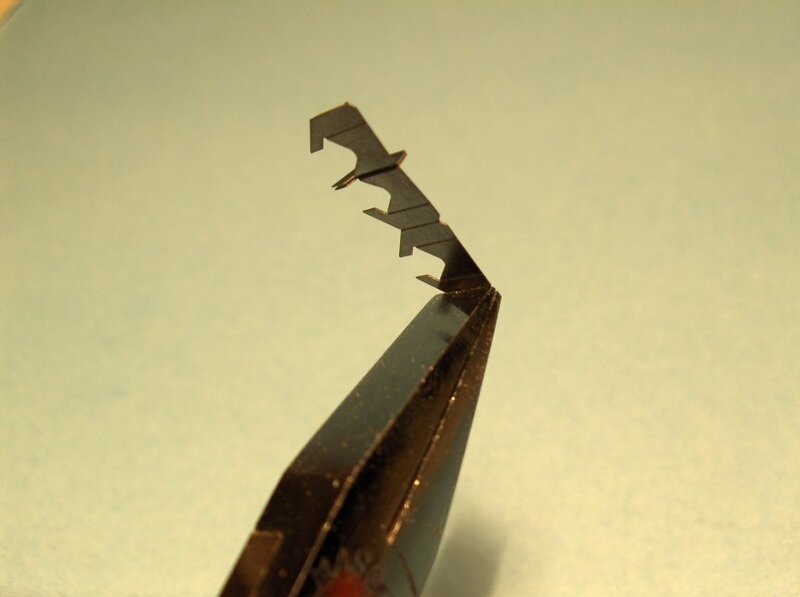 The clipper can get very close and remove the nub so very little filing or sanding is needed. Almost every model can benefit from a little added detail. Sometimes the modeling budget does not allow, or you just don't feel like, laying out the extra cash for after market details. 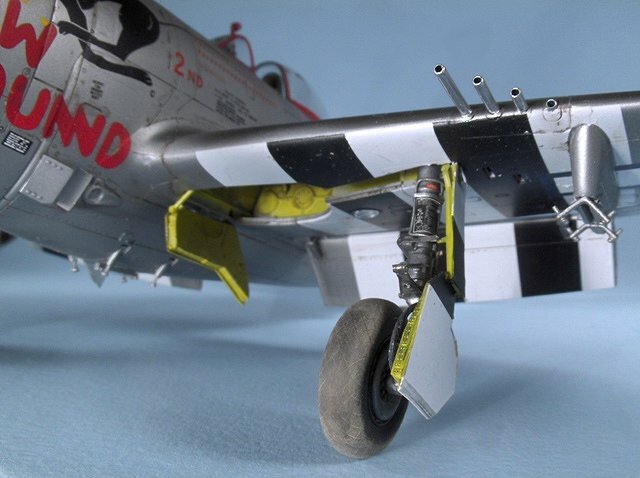 Some easy to do improvements can really dress up some plain landing gear. CLICK HERE to see how to makes these oleo scissors. 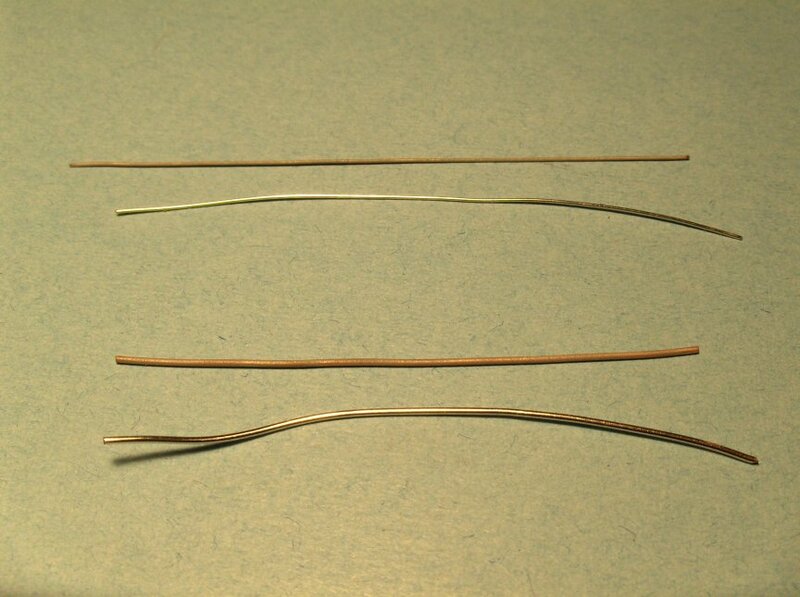 Examples of very fine wire for small scale details. A 6' lamp or extension cord will give you enough wire to last a life time. If you are like me, you have changed cell phones a few times and have unused chargers lying around somewhere. The drill bit and hair are for scale. Don't worry... my hair falls out pretty much on its own these days so it was not a huge sacrifice. 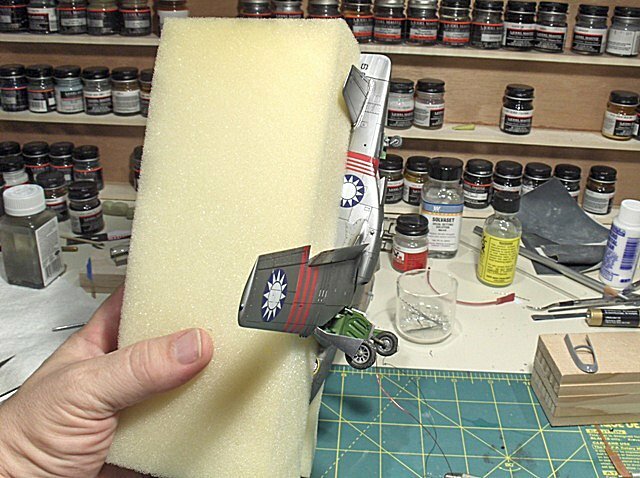 Here is a simply way to hold onto the model when you need an extra hand. 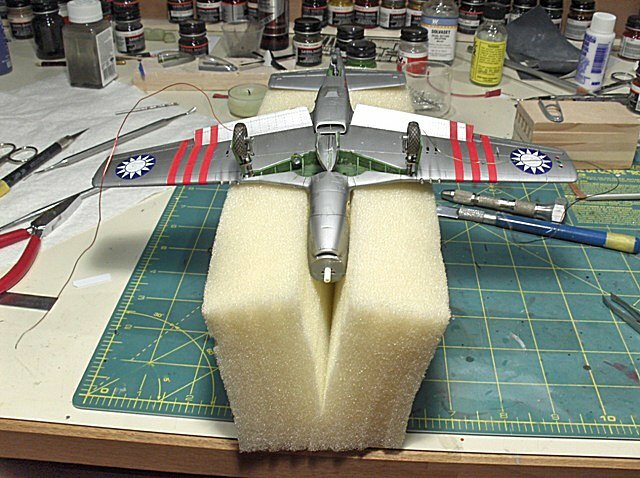 I made this just to do some decal on the underside of the wing but it turned out to be fairly useful is other steps of a build as well. Just cut a slit a couple of inches down the length of a piece of foam rubber. This is available from craft store in the pillow making/sewing section. Needless to say, holding the block of foam with a "real" hand defeats the purpose... but if you do need to pick it up it keeps the greasy finger prints off. You have a bunch of paint stir stick in every model you open. Cut the long straight parts of the spues after the parts are removed. Leave a bit of a number tag or a short 90 degree to help mixing. Usually when I am done with one model, i have enough for the next one... and so. If you have the space, let them out of the way and the next time you need to remix the same color, you are good to go. To PE or not to PE... that is the question. Sorry William S. You have heard the comment. I hate PE... too flat and 2 dimensional. In a lot of cases, there is something to be said about that statement. These are parts like any other. 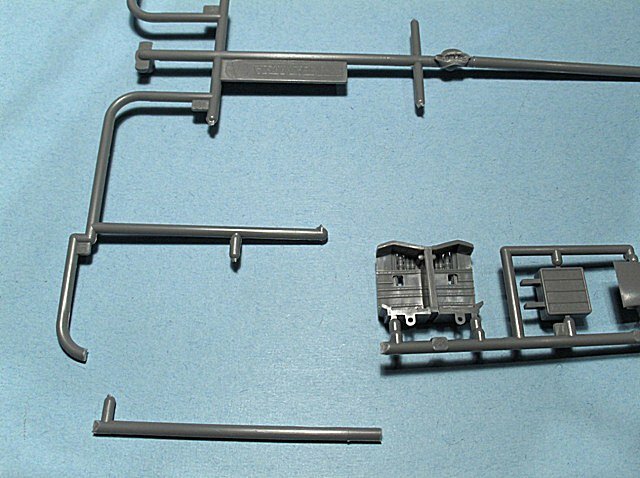 And just like the plastic parts, sometimes they need to be worked a little to make them better. I won't get into the "It's too hard to use..." discussion here. There is a learning curve for sure. I have tweezer-pulted many parts into oblivion. 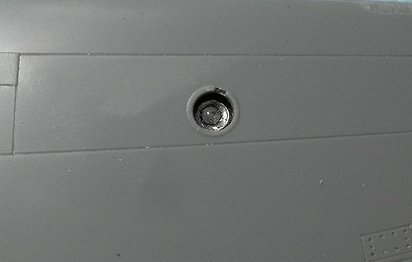 Ever note that you only need 2 tiny little tow rings for the 1/48 landing gear... but they give you 4. And you are thinking... WOO-HOO... EXTRAS! Yeah right. This demo will add a knob to a throttle lever. 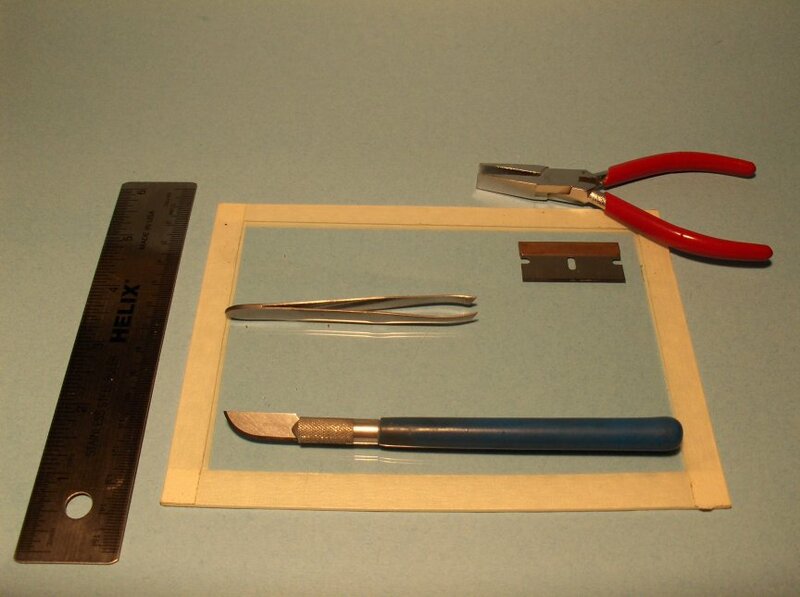 The basic stuff needed will be your PE set of course, a knife or cutter of your choice to remove the part form the tree, locking tweezers, a small tray to hold a drop of thick CA glue (that I forgot to put in the photo) and some accelerator. If you have them and, sadly, need them like I do... an Optivisor or equivalent. Remove the part and clean up any burrs that may be left. 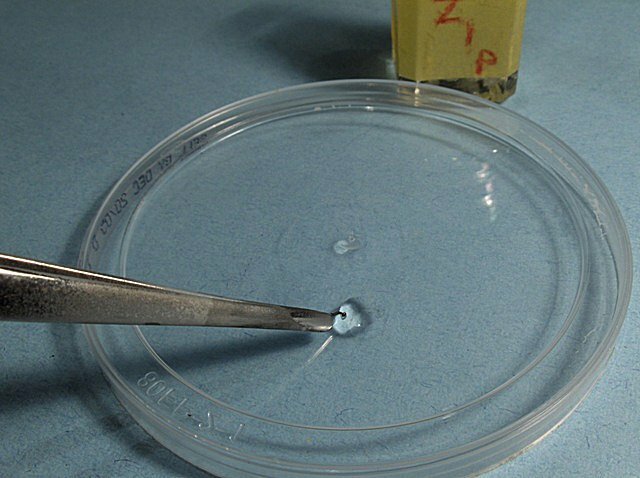 Clamp it in locking tweezers and dip the knob in a small puddle of thick cyanoacrylate (CA) glue. Now dip the lever into some accelerator for CA glues. I keep some in an old paint bottle to keep it handy for working with PE details such as these. Blow off the excess accelerator and repeat the process until you have an appropriately sized knob. Note how round it comes out. To make it larger repeat the process. Once the part has been dipped into the zip kicker, repeated dips in the CA puddle will make it harden. If oyu move quick you can get 2, maybe 3, dips in the CA. After that and you still need more, make a new puddle. A little gloss paint and you're done. A few of these on a throttle quadrant has a nice look. 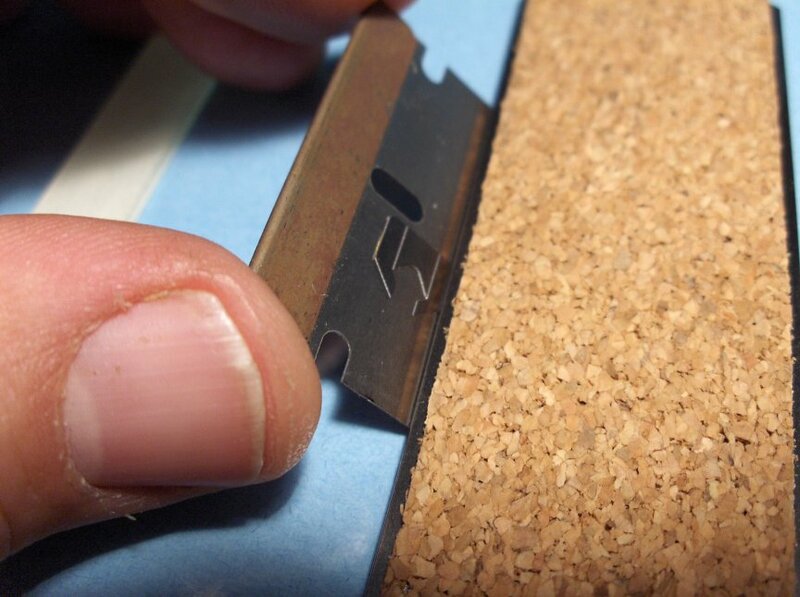 The sanding sticks can be cut into various shapes and sizes to get into the tightest places. I find that if I use the stick whole, I tend to use the ends only and all the material in the middle is wasted. This really minimizes waste by using almost the whole stick. I cut them with a Handi-Cut from Sears and it leaves a very clean edge to get in corners. 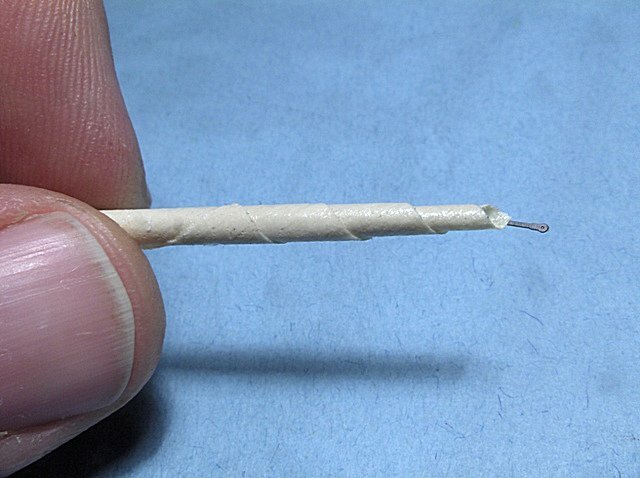 Holding tiny parts for gluing can be difficult sometimes. 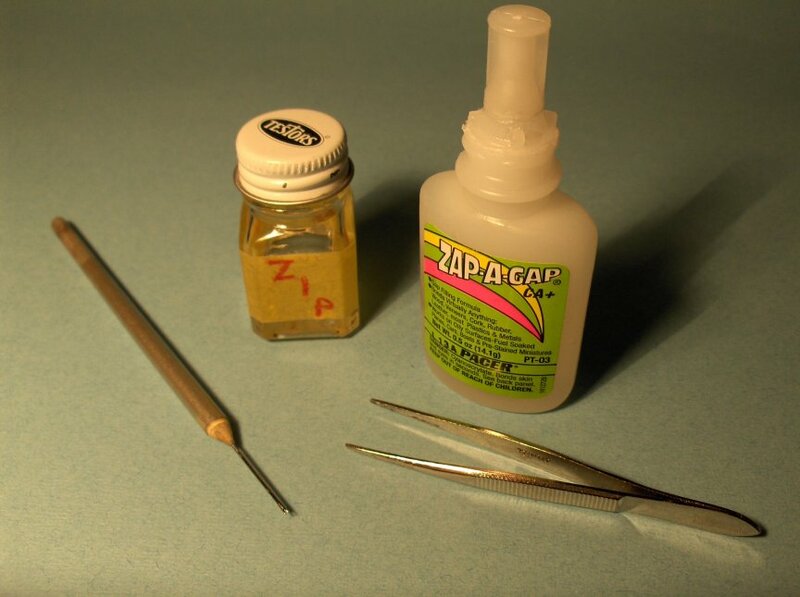 Loosen the grip with tweezer and the part can fly off never to be found again. Or worse, so use safety glasses. Roll a small piece of masking tape, starting at a corner and sticky side out, into a tight tube. This will give a little point to hold the part. 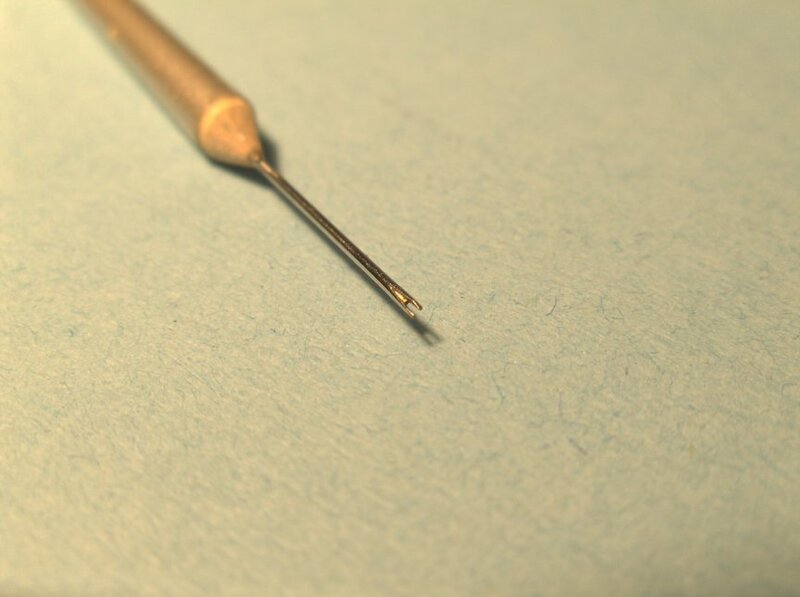 Apply some CA glue and hold the part in place of a few seconds, apply some accelerator with the needle tool shown above if needed. 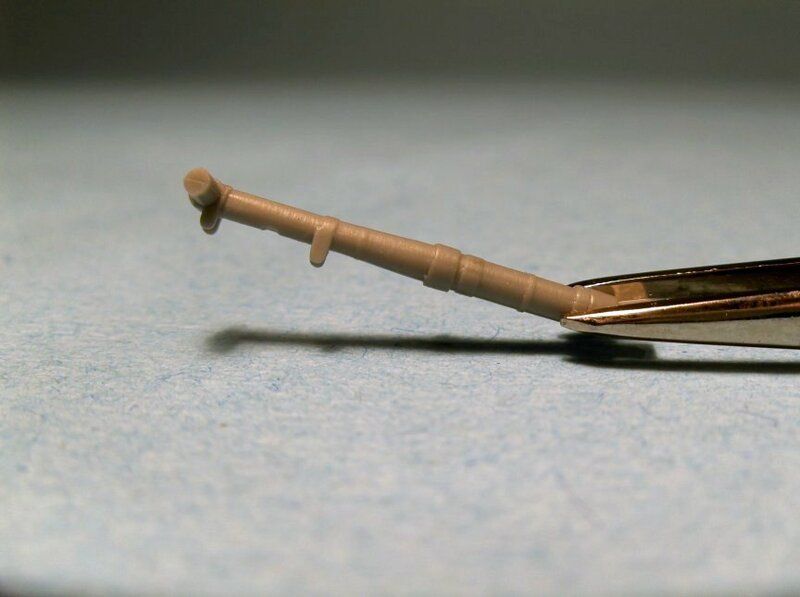 The holder can usually be pulled away, letting go of the part. 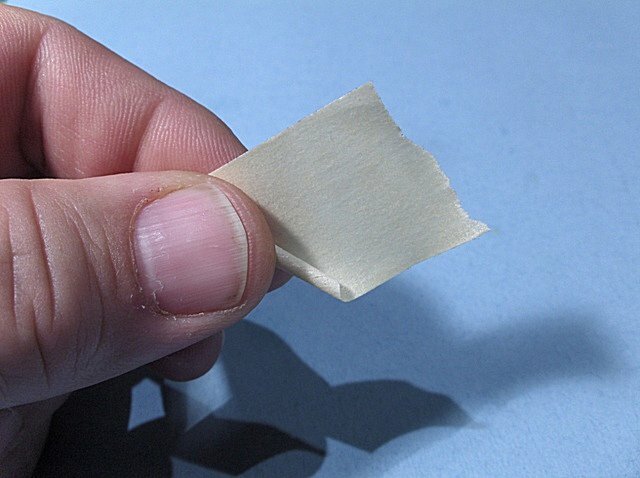 If not, press the sticky point to the back of your hand once and the oils will reduce the tack of the tapes' adhesive. 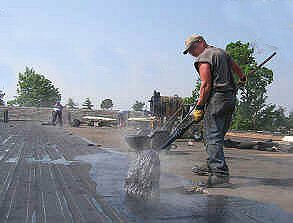 The subject of washes comes up fairly often on the various forums from newbs and pros alike. While this is far from being the be all to end all on washes, it should be a decent enough starting point. This is one of those areas where experimentation is best to find a combination that works best for the individual modeler in both ease of application and end result. Too bad we don't have a tiny little guy to brush the stuff just where we want it. Some aircraft that have one or more landing lights in the underside or leading edge of the wings. These are usually represented buy a hole with a clear disk filler or a curved clear piece with nothing more than a gray plastic disk behind it for the light. This is an easy little detail that can be made that will give something to see behind the lens. 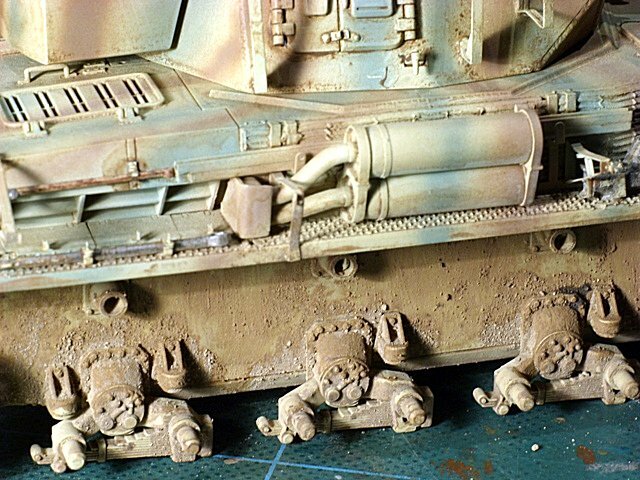 An easy method for painting and weathering tires. 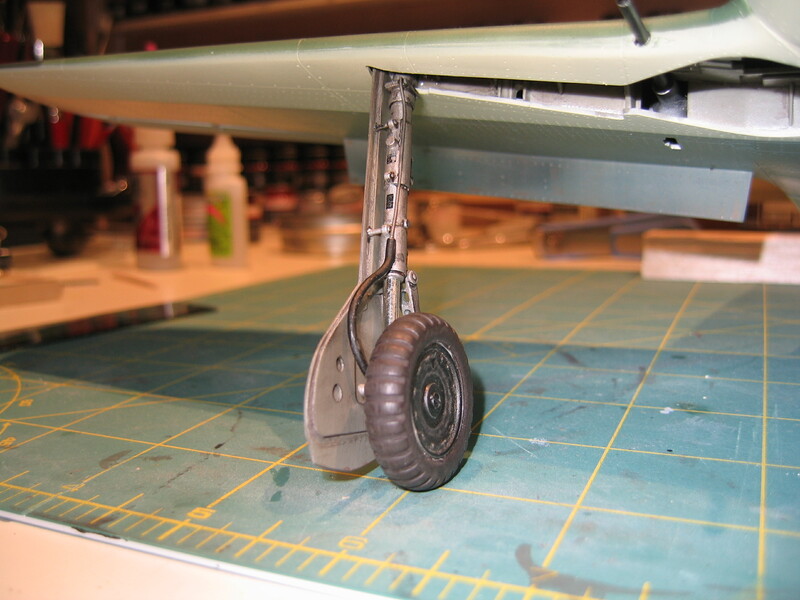 Easy to do landing gear doors. Need a Hinomaru? Make 'em 2 at a time.